The Loba live in the Mustang District of northern Nepal, at altitudes of between 11,000 and 13,000 feet. Mustang is a windy, arid, high altitude desert. It is surrounded on three sides by Chinese-occupied Tibet. Until 1992, this area was closed to the outside world. 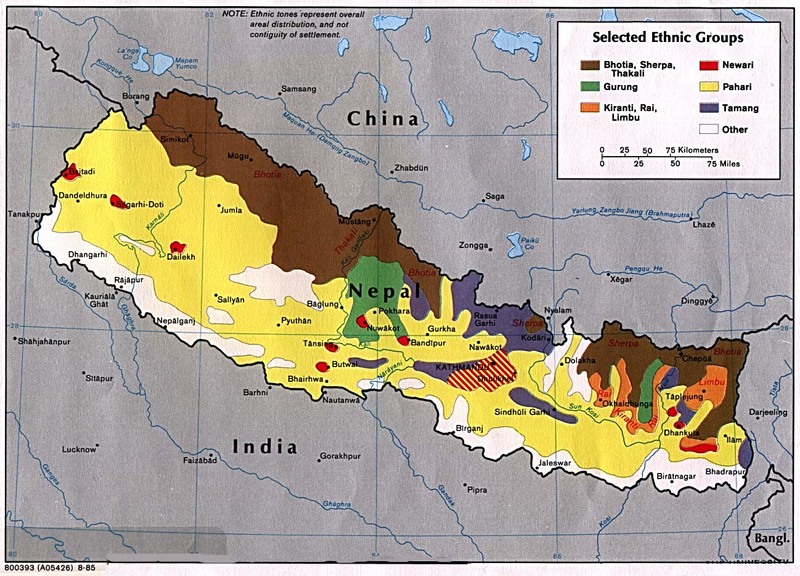 Mustang is a semi-independent kingdom within Nepal. Legends claim that a fierce soldier named Ame Pal founded the Kingdom of Mustang some time between 1350 and 1380. Its territory includes the source of the Kali Gandaki River. The name Mustang is derived from the Tibetan word meaning, "Plain of Aspiration." Socially, the Loba are divided into three groups, one of which contains those of royal heritage. Rules of society are based on the values of respect and honor. The structure of their families is also based on these and other traditions. One tradition says that the eldest son will inherit the family's property. When he does, the next son must become a Buddhist monk. The Loba are primarily farmers, shepherds, or merchants. They build their homes out of stone, making the roofs out of thinly chiseled stone squares. The roofs are extremely uniform and smooth, and on each corner a small square is constructed so that prayer flags may be hung there. Most houses are built close together and have no windows, only holes in the walls to protect against the high speed winds that race up the mountains. In fact, their homes are never built toward the South because of the fierceness of these winds. Unfortunately, this is a drawback in the summertime because the houses grow very hot due to the lack of ventilation. For this reason, people often sleep on the terraces during the summer to escape the heat. Although feudalism is more or less extinct in most of Nepal, it is alive and well in Mustang. This is evident even in the way the Loba build their homes. For example, the feudal lords build three-story houses; but the common people and those in the lower castes are only allowed to build single-story houses without walled in compounds. In Loba society, a person may have as many as three names. The first name is given by a lama, or Buddhist monk. The second name will be the name they received from their parents at birth. Their third name, which is given them by the guru, or the Hindu spiritual teacher, is to be kept a secret. It is common for a Loba woman to be married to several men, a practice known as polyandry. This is done because the Loba believe that there is less chance of a woman becoming a widow if she has many husbands. This is a unique feature of the Loba, but one that is slowly diminishing. The younger Loba want to discard it, but the older generation feels it is necessary. The Loba dress very much like the Tibetan tribes living in the Himalayan region. Both the men and women grow their hair long and often wear it braided. The Loba are very religious people. Two Buddhist sects, the Kargyupa and the Sakyapa, are dominant in upper Mustang. The Loba celebrate four major religious festivals: Gine, Gensu, Gelung, and Nayuene. Nayuene is celebrated once or twice a year and there are a number of rules that must be followed in order to observe it. These rules include a 48 hour fast and a vow of total silence. They also give to the poor and needy, and abstain from sexual relations during this time. The Loba live in a kingdom that was founded by a fierce soldier under the oppression of feudal lords. They were isolated for years and are completely unevangelized. The Lord longs to set the Loba free from earthly and spiritual bondages, and to birth them into the Kingdom founded upon His Son, Jesus Christ. The Loba who live in the Kingdom of Mustang remain one of the most isolated peoples in the world, both geographically and spiritually. * Scripture Prayers for the Loba in Nepal. * Ask the Lord to call people who are willing to go to Mustang with the Gospel of Jesus Christ. * Ask the Holy Spirit to cause the Loba to become dissatisfied with their traditional religions, and to make them hungry for the Bread of Life. * Pray that God will open the hearts of the governmental leaders in Nepal as well as the local leaders of Mustang to the Truth. * Ask God to send Christian tourists and hikers to Nepal who will share the love of Jesus with the Loba. * Pray that the Lord will raise up a strong local church among the Loba.